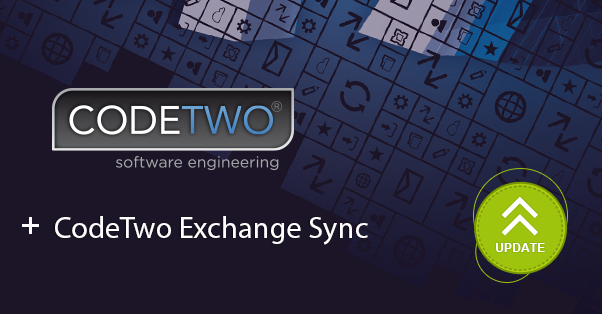 Update to CodeTwo Exchange Sync: Synchronize Exchange folders on Exchange 2016! For all those who have already moved to Exchange Server 2016 and can’t wait to synchronize exchange folders (e.g. public folders with users’ personal folders and view their content on mobile devices), we have good news – CodeTwo Exchange Sync is now compatible with Exchange 2016. This change was quite challenging, as Exchange 2016 does not use MAPI and CDO, which are required by our program to work. As a result, CodeTwo Exchange Sync has been extensively rebuilt in version 2.7, and now it fully supports Exchange 2016. You do not install the program on Exchange Server 2016 (only client machines are supported for the installation). The client machine where CodeTwo Exchange Sync is installed is equipped with Outlook 2013 or Outlook 2010, and .NET 4.0 (or higher). To learn more about changes in version 2.7, please visit the version history page or refer to the system requirements section in the User’s manual. How to get CodeTwo Exchange Sync? To download the version 2.7 use the link below or visit the official product page of CodeTwo Exchange Sync. To update the software, make sure the program supports your current environment and simply run the installer on top of the old installation. In case you do not use any previous version of CodeTwo Exchange Sync, simply perform a fresh installation on a client machine. More information on the installation process can be found here. This update is free of charge for all licensed users. If you have any additional questions, do not hesitate to contact us – we are open 24 hours a day, 5 days a week.